On this precious feast of the church, one of the few feasts in which we honor the day by fasting, I feel it is time to post something that has been percolating for some time in my mind and heart. It is the importance of sacrifice that the cross represents in our life as Christians and how antithetical that sacrifice is to us comfort-loving Americans. The quite provocative title of this post may lead the reader to conclude that I have strayed too far into the dangerous waters of conservative fundamentalism, that view of the world that constrains truth and limits people to operate within the confines of an overly rigorous ideology. While I do believe that church pews encourage laziness and lack of rigor in our worship, I also believe, paradoxically, that they limit our freedom of worship, a belief that I have tested and found true on my own children. Most of my children have grown up without pews in church, or rather, with most of the pews consigned to the outer limits of the worship space. Consequently, when we worship at churches who do have pews, I find them rebellious toward this new “wall” that cuts them off from the altar and communion with God and their neighbor. Many proponents of pews suggest their necessity for families who are trying to keep their children from excessive wandering. While I can see that they are effective for this purpose, they also have the unintended consequence of creating a private, pew-enclosed world for the little ones in which they have to be distracted and entertained away from the main service. And then there is the real problem with pews. They are prostration inhibitors, bowing blunters, kneeling nullifiers, and an overall message that the real work is being done by the professionals on the stage and not THE PEOPLE. They originate from a 16th century Protestant shift from Liturgy as the work of the people performing the timeless sacrament to Liturgy as a passive listening to a sermon. 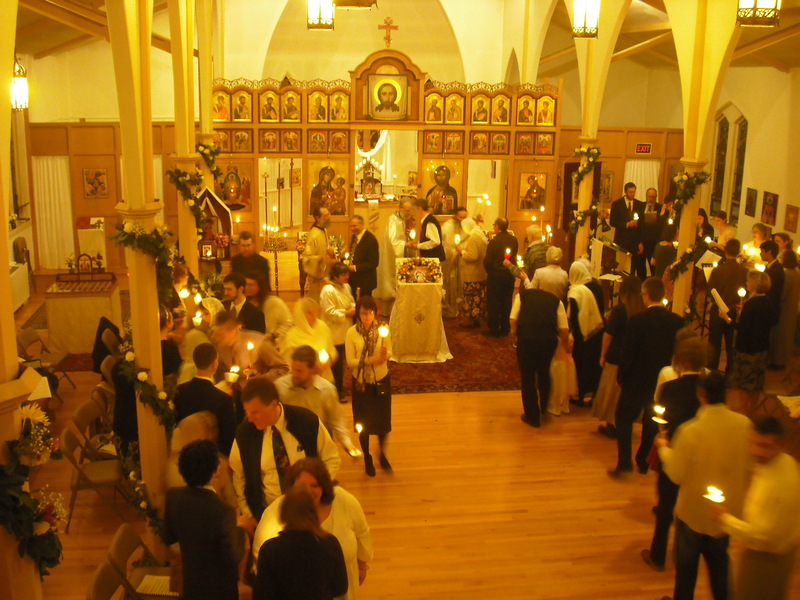 And we in the West who have never witnessed life in an Orthodox country without pews often just take them for granted. What would it be like without them? Would I really have to stand through the whole service? But standing isn’t all that we do in worship. When our access to the Holy Altar is not inhibited by these artificial barriers, we get to do all sorts of things. We process around the church, kneel before our favorite saint’s icon, light a candle at our favorite shrine, sing for a while at the choir stand, receive the holy mysteries, confess our sins to the priest, say a special prayer for someone in need, give money to a special cause… the possibilities are almost endless and they are not constrained to a part in an organized service, nor are they constrained to the confines of the church’s own walls. When all of this activity really gets cooking, the Liturgy even spills out into the street where access to the holy becomes very tangible and real. So, it isn’t that Orthodox are against sitting down, which is by the way one of the postures of worship. We do believe there is a time to sit and receive the Word. But there is so much else to do in church besides sitting that an overabundance of pews precludes a person from doing. And, in the final analysis, not having seats like in an auditorium makes the church feel that much more like home. 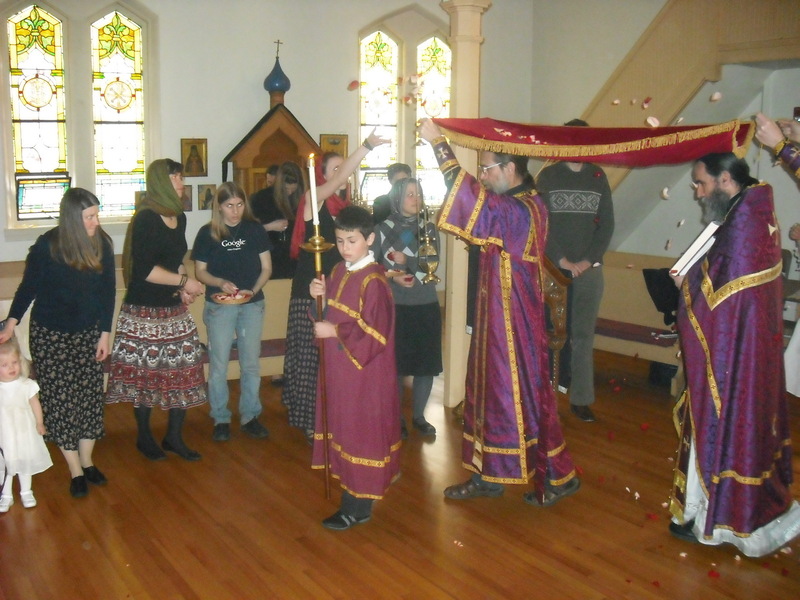 Everybody stood through the long Byzantine ritual, but not stiffly. To these peasants their church was the hearth of God and they made themselves at home, moved about, nodded, spoke quietly to each other, or called out Christmas greetings with their eyes and their wide smiles. This entry was posted in Holidays (Holy Days) and tagged Bulgaria, Bulgarian Peasant Life, church pews, Dobry, Orthodox Christianity by Mendicant Monk. Bookmark the permalink.